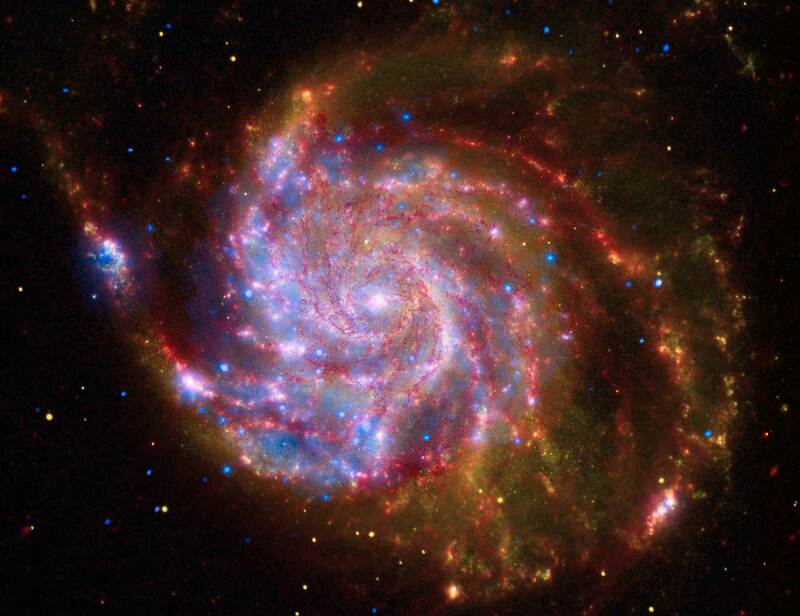 STScI-2009-07 - This image of the spiral galaxy Messier 101 is a composite of views from the Spitzer Space Telescope, Hubble Space Telescope, and Chandra X-ray Observatory. Each wavelength region shows different aspects of celestial objects and often reveals new objects that could not otherwise be studied. The red color shows Spitzer's view in infrared light. It highlights the heat emitted by dust lanes in the galaxy where stars can form. The yellow color is Hubble's view in visible light. Most of this light comes from stars, and they trace the same spiral structure as the dust lanes. The blue color shows Chandra's view in X-ray light. Sources of X-rays include million-degree gas, exploded stars, and material colliding around black holes. Such composite images allow astronomers to see how features seen in one wavelength match up with those seen in another wavelength. It's like seeing with a camera, night vision goggles, and X-ray vision all at once.